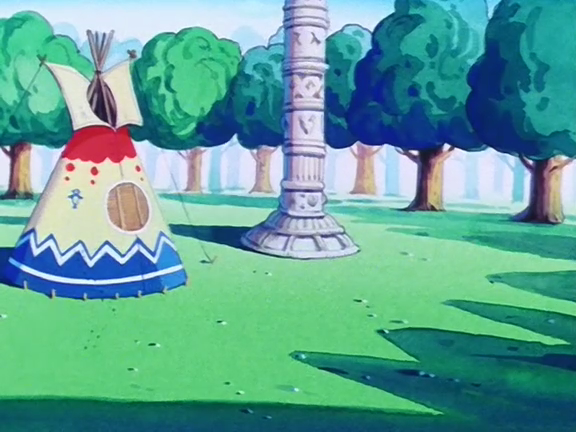 Correspondent "Not Who" sent me another item about an anime and video game:In Dragon Ball, another very popular anime, there is actually a "tribe" of Indians who make several appearances through the show and the two series following. BoraBora is a tall, muscular man who resides in the Sacred Land of Korin with his son Upa, in a tepe at the base of the Korin Tower. UpaUpa is a member of the native tribe who serves as the guardians of Korin Tower. 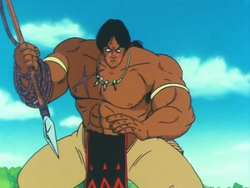 His father, Bora, is the chief of the tribe. Sacred Land of KorinThe Sacred Land of Korin (聖地カリン) is a village located at the base of Korin Tower. It is where Bora and Upa live. Comment: Again, these characters look like your standard generic Indians. I don't see anything distinguishing them from thousands of other fantasy Indians. Locating them in a fictional world unconnected to any land or culture only compounds the problem. For more on Indians in video games, see Assassin's Creed 3's Native Heritage and Justin Rain in Transmedia Defiance. I should point out that all Dragon Ball characters are oddly-drawn. Goku is canonically 14, but looks 5. *Dragon Ball uses a lot of theme naming. Two shapeshifters, Oolong and Puar, are named after tea. One girl, Bulma, her and her family are all named after underwear. (Bulma is buruma, or bloomers.) The spinoff, Dragon Ball Z, introduced the Saiyan race and they're all named after plants, albeit in Japanese. And a load of memes. "Dragon Ball is actually an anime, not a game." Well, while it is a cartoon, it is also many popular videogames, in fact.